Dr Lukasiewicz has an interdisciplinary background in the social sciences and currently works in the field of water governance. She is particularly interested in applying social justice theories to every-day water management decisions. Her earlier research interests revolved around sustainable development and the social dimensions of the triple bottom line. 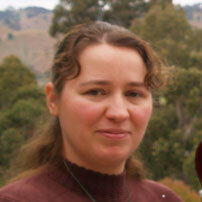 Dr Lukasiewicz is currently undertaking collaborative research on social justice in the Murray-Darling Basin. Her previous research was in low-risk climate change mitigation and adaptation that avoids unintended consequences at a catchment level. Lukasiewicz,A., Pittock, J. & Finlayson, C.M. (2016). Are we adapting to climate change? An adaptation assessment framework for managing freshwater ecosystems. Climatic Change, Vol 138, Issue 3, pp 641-654. Lukasiewicz A., Bowmer, K., Syme, G. & Davidson, P. (accepted). Assessing government intentions for Australian water reform using a Social Justice Framework. Society & Natural Resources. Patterson, J., Lukasiewicz, A., Wallis, P., Rubenstein, N., Coffey, B., Gachenga, E. & Lynch, J. (submitted). Tapping fresh currents: fostering early-career researchers in transdisciplinary water governance research. Water Alternatives. Ogilvie, A., Mahé, G., Ward, J., Serpantié, G., Lemoalle, J., Morand, P., Barbier, B., Diop, A. T., Caron, A., Namarra, R., Kaczan, D., Lukasiewicz, A., Paturel, J.-E., Liénou, J. & Clanet, C. (2010). Water, agriculture and poverty in the Niger River basin, Water International, 35(5), 594-622. Lukasiewicz, A., Syme, G., Bowmer, K. & Davidson, P. 2012. Social justice in water reform: Why Aboriginal communities have been missing out. Paper presented at the 14th biennial conference of the International Society for Justice Research, Rishon LeZion, Israel, 10-12 Sepember. Lukasiewicz, A., Bowmer, K., Davidson, P. & Syme, G. (2012) Contested knowledge: Government and landholder perceptions of climate change and water reform. Paper presented at the Practical Responses to Climate Change, Canberra, 1-3 May. Lukasiewicz, A, Finlayson, C.M., Pittock, J. (2013) Identifying low risk climate change adaptation in catchment management while avoiding unintended consequences, National Climate Change Adaptation Research Facility, Gold Coast, pp.103. Lukasiewicz, A., Finlayson, C. M., & Pittock, J. (2012) Identifying low-risk adaptation: A case study of the Goulburn Broken Catchment, Institute for Land, Water and Society Report no. 72, Albury, Australia, pp.50. Lukasiewicz, A., Finlayson, C. M., & Pittock, J. (2012) Identifying low-risk adaptation: A case study of the Murray Catchment, Institute for Land, Water and Society Report no. 74, Albury, Australia, pp.50. Lukasiewicz, A., Finlayson, C. M., & Pittock, J. (2012) Identifying low-risk adaptation: A case study of the Lachlan Catchment, Institute for Land, Water and Society Report no. 75, Albury, Australia, pp.50.